Is Saints Row IV too outrageous? That’s a question that has been thoroughly debated by fans of the series, mostly divided by the fans of Saints Row 2 and the fans of Saints Row The Third. 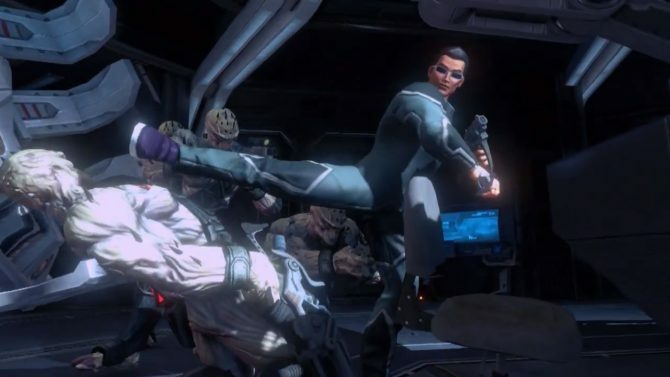 While fans of either installment debate which is better, the developers at Volition wanted to make a game accessible to both camps: the colorful cast of characters, crazy activities, and lively world fans of Saints Row 2 felt was missing in its sequel, and the hilarious dialogue, story missions, and refined gameplay fans of The Third felt improved on its predecessor in every way. What gamers will get is a game as truly crazy and insane as the previous installment, with all types of missions and side quests to keep them busy, and completely new gameplay mechanics–the superpowers–that prove this game is a full sequel, and not the expansion pack it could have been. But even better is the narrative, which–in its own zany, Saints Row way–actually makes the most sense of any story that has come before in the series. 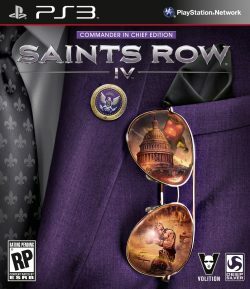 If you’ve read any Saints Row IV news at all, then you know that the premise of the game is that the Saints have taken over the White House (now rechristened the “White Crib,” complete with stripper poles and pet tigers), with the leader of the Saints–that is, you, the player–ascending to the seat of presidency. But not long afterwards Earth is invaded and destroyed by Zinyak, the alien leader of the Zin Empire, with Earth’s inhabitants forced into a simulation world where they can be easily controlled. It doesn’t take long for the sociopathic president to figure out what’s going on, and, upon escaping, goes about freeing his fellow Saints so that they can save the rest of the human race. As incredibly outrageous as it may sound, this story makes the game come together in various ways: the most subtle is giving players a world in which the Saints’ love of mayhem makes complete sense. Besides the idea of living in a universe where over-the-top violence is just part of everyday life (perhaps Saints Rows‘ patron god is a Taratino-like divinity), you’re not just doing destructive activities just for the sake of, you’re doing it to “disrupt the system.” Everything you do during the course of the game now has a larger purpose: when you do a side quest to steal a tank and blow up as much property as possible, you’re doing it to cause chaos and overload the system. You no longer buy property in this digital Steelport, you hack stores to slowly takeover grids/neighborhoods and conquer the simulation neighborhood by neighborhood. It may just be the same idea dressed in another way, but it just feels right for what Volition was going for. And as always, the story is easy to follow and hilarious to watch, with the same tongue-in-cheek dialogue that the series is known for. 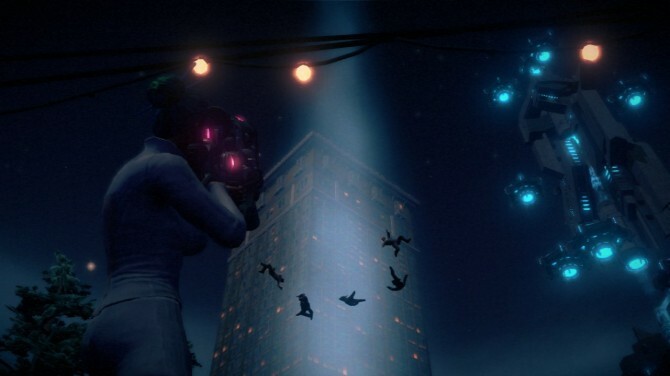 Saints Row IV references many franchises during the course of the narrative and through the game’s design, but largely draws inspiration from The Matrix (for obvious reasons), and to a lesser extent, the Mass Effect series. Expect to follow some of the same basic threads: waking up from the simulation covered in red goo, being brought back to the real world with a crew of the last free humans in the universe, diving back into the simulation to free your allies and recruit them to your team, and then doing loyalty missions to give them a little more firepower for the later, more challenging tasks. But again, all of this is done to parody some of the biggest tropes and trends in video gaming and film: expect to find segments that mimic old school text adventure games, major genre-defining games like Metal Gear Solid and Streets of Rage, little Easter eggs in mission and trophy titles (like “Zero Cool,” “White Rabbit,” “Whoa,” and “Ooh, A Piece of Candy!”), and even the chance to “romance” your teammates. Gameplay has been given a significant overhaul with the addition of superpowers, and I daresay for the better. No longer will players have the option to use different types of explosives, but instead have access to four major power trees, which each have two or three variants that can be leveled up and tailored. For example, players have a “Burst” ability, which includes the ability to burn enemies or the ability to freeze a group until you shoot and shatter them. Later Burst can be leveled up to not only hit more enemies and do more damage, but to make enemies stay affected longer and to explode upon expiration. After telekinesis is unlocked, players can also unveil an electric power up of the power that uses the held object to shock anything nearby; later they can unlock a life-stealing ability that lets you pick up an enemy and leech his health to refill yours. And while it wasn’t my favorite at first, the “Stomp” ability later allows you to upgrade to a gravity variant which–upon stomping the ground–makes everything nearby hover in the air, allowing for easy target practice. And these are just a few of the active powers. There are also passive abilities, like the ability to jump high and long distances, and the ability to run at superspeed. 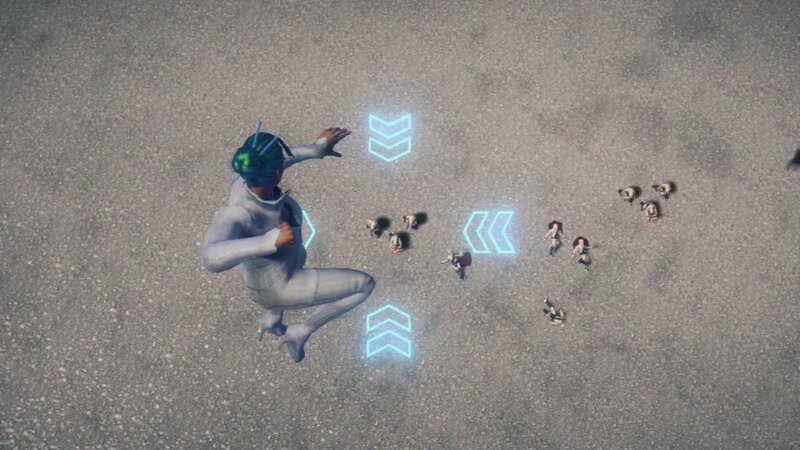 These abilities also get leveled up as the game progresses, and you can choose such upgrades as a glide ability that lets you sort of skydive and direct yourself as you fall (which comes in handy for precision jumps), and wall-running, which lets you run up buildings at superspeed. The only odd thing about these abilities is that the game still encourages you to buy, upgrade and customize vehicles, which frankly are outclassed by your superpowers. I tried, out of sheer stubbornness, to still care about driving, but getting to objectives is just far easier when you can outrun traffic. And the further you upgrade your abilities, the less and less certain things feel necessary. Weapons, though, are still highly important to the game, especially since your superpowers need to recharge periodically between use. This encourages the player to build up quite the collections of firearms, which include such ridiculously awesome guns like the Dubstep Rifle, which makes enemies party themselves to death, and the Singularity Gun, which opens up black holes wherever you shoot it. Again, with the premise of the game set in a made up, digital world, these wonderfully whacky weapons (alliteration!) make sense, even if you’re not trying to think too hard on realism. Weapons like The Third‘s “Shark Gun” DLC would make great additions to Saints Row IV, only because a gun that summons sharks from below the streets would be at home next to a gun that disintegrate foes with one shot, and an “Abduction Gun” that raptures enemies right into sky to their deaths. Missions and side quests are incredibly diverse, owing mostly to the powers players have access to for most of the game. 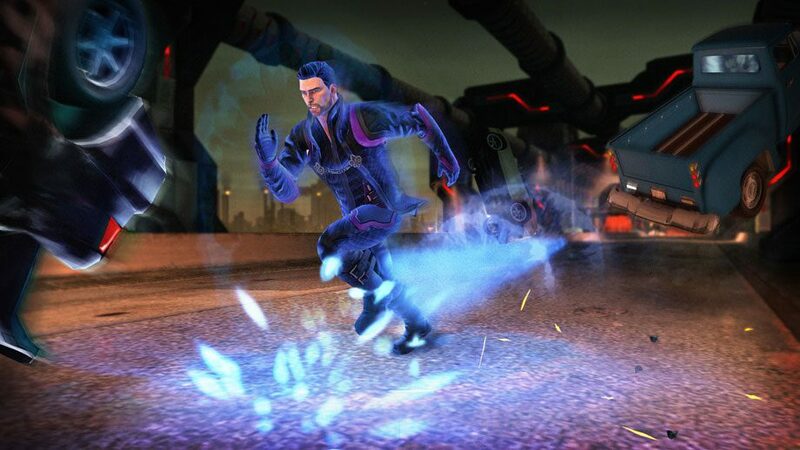 Some of these kinds of missions you’ve seen before, especially in superhero games: racing time trials or defending an area against a horde of enemies are certainly common at this point, but Volition adds enough Saints Row flair to make them unique to the game. 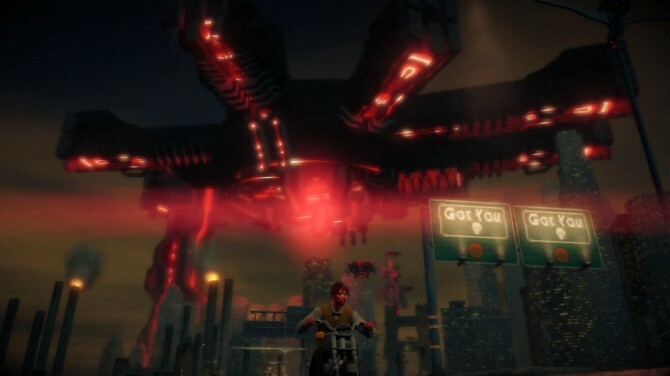 There are a number of Mayhem missions, for example, which are divided by the tank, UFO, and mech vehicles you can use to cause chaos; there are a number of “Rift” missions in a virtual pocket world which have you doing anything from using your powers to perform precision jumps, to using your telekinesis to destroy machines with explosive spheres. 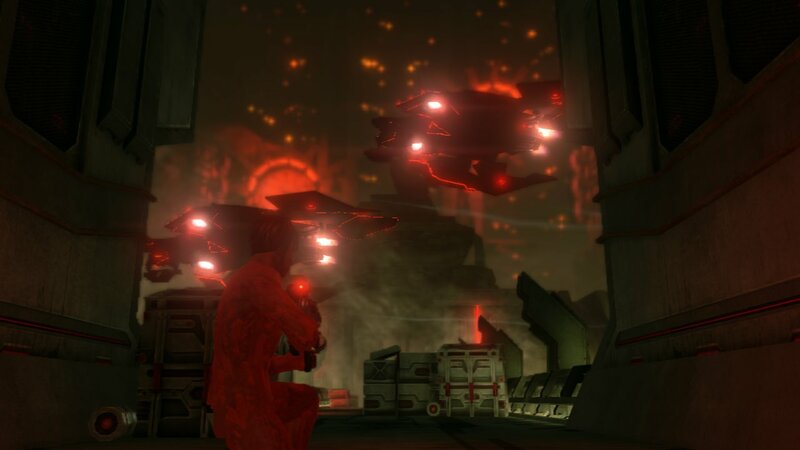 Hotspots are tall towers shielded by large, domed force fields which must be shut down by destroying the heavily guarded shield generators that power them. Gang operations make a return in the form of “Flashpoints,” where killing every alien present converts a tower and frees the neighborhood from Zin control. Even Professor Genki is back, but this time in “Mind Over Murder” (or M.O.M. ), a new game of death. There are Gateways you can open so that you have more ways to enter and exit the simulation, and loads of “Collectibles” to find, including Clusters, which are glowing spheres of energy that you can spend on upgrading your powers. Enemies don’t just drive and crash into situations anymore; now some arrive via portals, portals which will keep opening near you if your notoriety is high enough. Saints Row IV has been said to have the most range of enemies of any previous installment, and it’s hard for me to disagree. 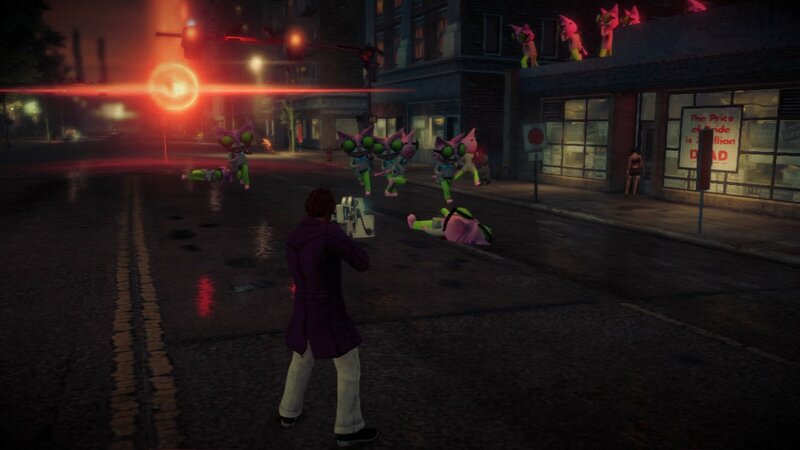 Players in Saints Row IV can expect to fight the “ZPD,” human police officers programmed by the Zin to hunt you down for simple disturbances; the Zin alien soldiers, tasked with backing up the ZPD for serious enemies; Murderbots, Terminator-like enemies who can take loads of damage, and the powerful Wardens. Wardens are criminals of the Zin Empire who are being allowed to run around the Simulation and harass humans, and have special powers that you can usually absorb after defeating them. If you can defeat them, that is: they have force fields that have to be Blasted away periodically before you can get any real damage on them, and besides being constantly mobile, they’re unnaturally adept at dodging your projectiles. These are just a few of the most common enemies you face in the game, a game which also includes large walking machines of death, C.I.D. units that can revive enemy soldiers and blanket them in a protective force field, elite Zin who also have minor super abilities, gangs from the past, and more. Customization and visuals are, admittedly, about near-identical to The Third, but this is okay: you can actually upload your character from the last installment if you choose to, or create a new one from scratch, which now includes the legendary Nolan North in place of the Zombie voice. Weapons are now customizable, allowing you to choose different skins and to upgrade the stats specifically, like increasing accuracy, clip size, and reload speed, and add damage perks like “Acidic Ammo” for poisoning enemies and “Explosive Ammo” to add a little bang to your bullet. The skins offer some truly unique, fun designs: I, for example, had the Rubber Band SMG, which looks like a giant rubber band gun; a Wireframe Cumia Magnum Heavy Pistol, which made my gun have a transparent colorful look; and a Gunmetal Kardak Lasershot shotgun, which had a Teslapunk/Steampunk look. 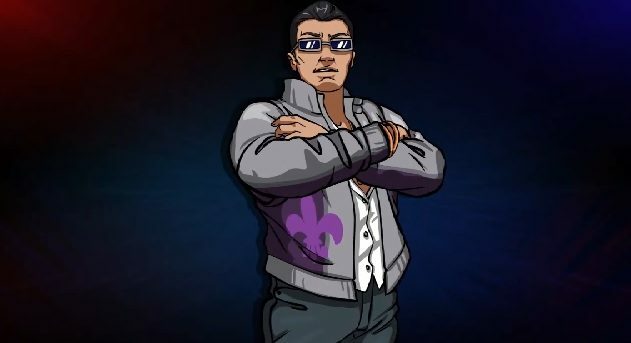 While fans of the series may be sad to hear that some characters didn’t make it to this game (or aren’t featured long in it), others return from both Saints Row 2 and The Third, with Saints Row IV bringing players back to the past in some way or another just as much as taking them to the future with the story’s premise. The two Shaundis seen in one of the game’s many trailers, for example, involves taking players back to what happened in the second game with Shaundi’s then-boyfriend Veteran Child, and as the Gat-Is-Back trailer shows, Johnny Gat also returns with his own tale and missions. With the use of character-specific missions and loyalty missions, Saints Row IV gives each character enough of a spotlight to highlight their past in the series, and more importantly highlights their connection with you, the protagonist. Steelport is as much a character in the game as anyone you fight and kill beside, although some fans found Steelport to be “less lively” than Stillwater. Unfortunately you’ll find that Steelport is virtually the same, although there are some attempts to make the scenery more interesting, with spaceshifts hovering above, towers around the city, and a little more variety to vehicles and civilians. What was the hardest thing to get used to at first is that the city is perpetually stuck with nighttime skies, to add to the theme that the simulation is a world of slavery. What is pretty cool is that Steelport reacts to your progress in the game: while it will start off with Zin structures bathed in a harsh, oppressive red Tron-like visual aesthetic, the more you take on missions that free the inhabitants of the simulation, the more things start to turn a more calming blue. By the end of the game, Steelport will be restored to normal, with clear skies and all. There were some issues I had with the game, which only popped up occasionally: I once finished a mission, but was told I failed even though I know for sure I completed it correctly. I did the same thing all over again, and this time was told I passed. I’ve also seen some minor visual glitches, but nothing a player of Saints Row 3 haven’t seen before here and there. Twice I had a moment where my allies needed to progress to allow me to move on in a mission: the first time I was able to shoot the ally a few times (they took no damage, of course) to budge her and get her to head to the objective marker; the second time I could do nothing to get the game to register the objective I completed, and had to restart from the checkpoint and do it again. Sometimes when running and jumping up walls in tandem, your character will freeze into a standing position, and just hover up the wall stiffly until a few moments pass. Again, these occurrences don’t happen often, but at times can be a little annoying. Also annoying was that the game has players largely relying on health drops to restore their vitality, which–while retro–makes certain battles unnecessarily difficult early in the game. Later upgrades will make this easier to deal with, and specialized abilities will eventually teach players to think more strategically when entering battles, but I it feels like a tacked-on way to add dimension to a game that already changes so many things extremely well: big things like the refined controls, and little things like the ability to listen to the game’s radio stations even when not in a vehicle. Is Saints Row IV the game for you? That’s still hard to say. The game definitely leans towards players who enjoyed Saints Row The Third, but it’s hard to hate a game that has a famous classic wrestler that pops up during a mission “when he’s needed most,” having “What is love?” play while fighting your way out of a prison ship (of course I bobbed my head), and fighting Paul, the giant Saints Flow Energy Drink Can. But even for players who don’t like these larger-than-life moments, there are plenty of missions that actually take away your powers, giving you a taste of the more subtle, nuanced missions of older games. And while I didn’t get to play the game with a pal, I can only imagine that having a Superfriend along for the ride will only make it better. 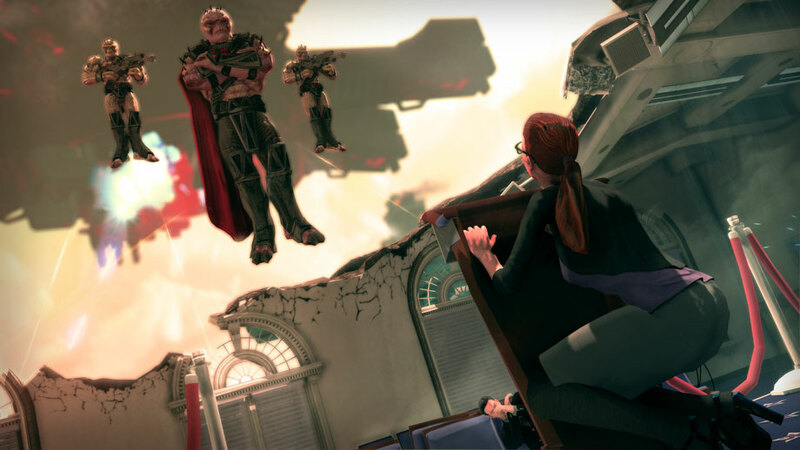 With Volition claiming that this is the end of the current set of stories for your protagonist, fans of both Saints Row 2 and The Third owe it to themselves to see the Saints’ wildest adventure yet. I can’t wait to see what DLC makes it to the game–considering original plans had a Monkey gun, dragons, and Stephen Colbert, Meryl Streep and The Rock– but this is already a truly fantastic game featuring some of the best superpowered mechanics I’ve played within a sandbox world, and one of the best ways to turn off your brain, let off some steam, and enjoy a action-packed, humor-filled ride. Note: For a closer look at the game, check out my gallery below, which was uploaded via SaintsRow.com’s Camera Feature. 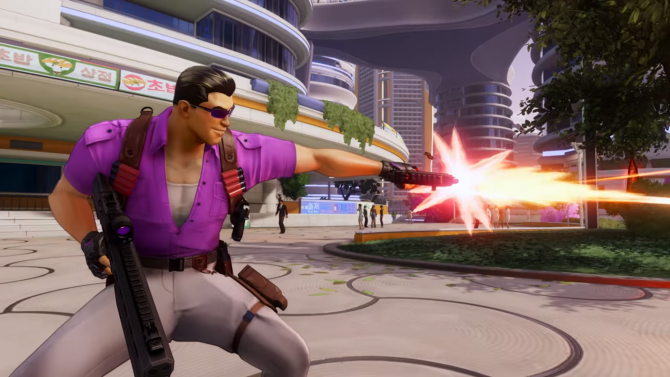 Agents of Mayhem's Johnny Gat Agent Pack, which was originally GameStop exclusive pre-order DLC, is now available for all players to purchase on PC, PS4, and Xbox One.